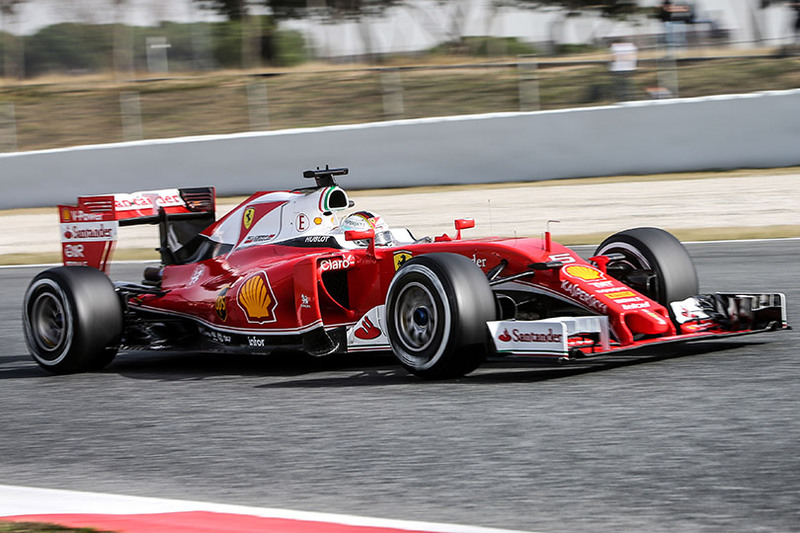 Sebastian Vettel proved fastest once again in the morning session on day 2 of pre-season testing at Barcelona. Along with Ricciardo, he also debuted Pirelli's new ultra soft tyre compound that is available this season but basically unsuited for more than 3 laps around Circuit de Catalunya. The day was kicked off with Rosberg, Alonso and Ericsson out on track in the first minute, but it was only Rosberg who managed to immediately go round for a few more laps. All others followed suit, and only Haas was not seen in the first 80 minutes until Gutierrez finally got the car out for a banker lap, running a re-engineered front, following up on yesterday's front wing support failure. The first hour was also fairly quiet for Ferrari and McLaren. Both teams only ran 7 laps in that period, although they were running big aero rakes while they were on track, followed by some time in the box to get those removed for further running. Williams on the other hand saw Bottas go fastest on his third lap, only to return to the box after 6 laps, and remain there for the next hour. After 90 minutes of running, Rosberg got back in charge by recording a 1:25.479, 4 tenths ahead of Perez in the VJM09, a second ahead of Ricciardo and 1.4 seconds quicker than Bottas. Fernando Alonso with the McLaren kept a slow pace for a long time during the morning session as the team evaluated some components, but halfway through the session, he picked up some pace, even though still not all that impressive. In the closing stages, Pirelli's new ultra-soft made its debut this year as Vettel and Ricciardo had a go at a few flying laps, smashing last year's pole time comfortable. Vettel eventually ended 7 tenths quicker than Ricciardo whereas Rosberg and Mercedes opted to stay on the medium tyres.